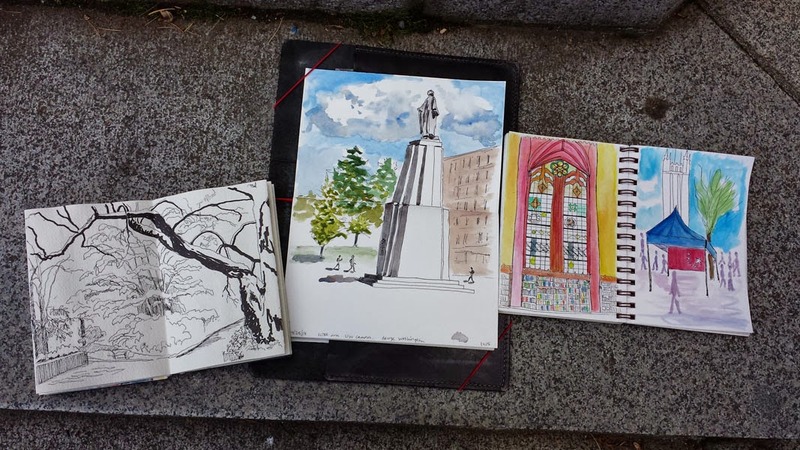 More than a year ago, the Seattle Urban Sketchers got together at Suzzallo Library on the University of Washington campus. I didn’t have the courage to take on its spectacular Gothic architecture, so I settled for one of its many ornate windows. Then I had to sketch in the library coffee shop to recover. I had a form of déjà vu today when a very small group of Friday ad hoc sketchers met at Suzzallo again. This time I was feeling somewhat cocky – after all, I “passed” Stephanie Bower’s Good Bones workshop only last month! – so I went straight up to the quiet study room, which is as vast and tall as any cathedral. I searched for and thought I found my vanishing point, but just then, right before my eyes, the arched ceiling and walls deteriorated into Dali surrealism. A sketching debacle ensued (although too unsightly to post here, the evidence is on my personal blog). Fortunately, if there’s one thing I’ve learned about sketching, it’s that if a sketch is going badly, abandon it immediately. 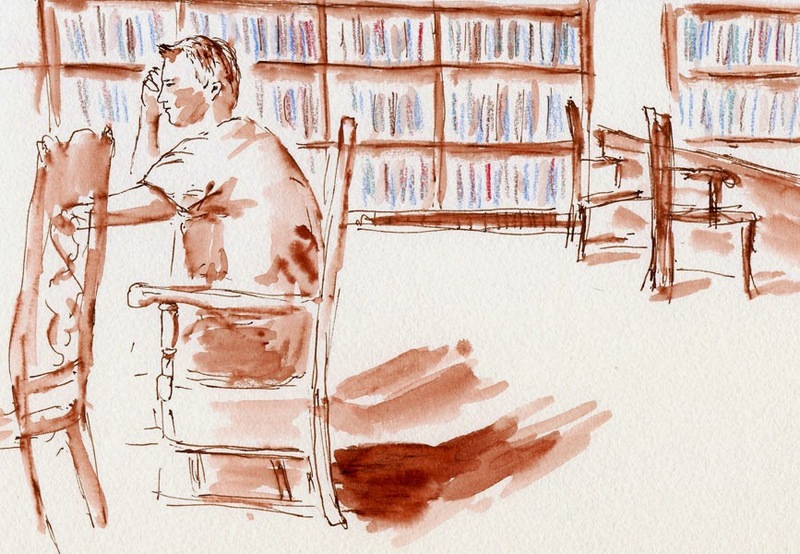 To lick my wounds, I retreated to a different part of the quiet study room and sketched a student – something firmly planted in my comfort zone. By the time I finished that sketch, sunlight was streaming through the stained glass windows, and I figured it was getting warm enough to sketch outdoors. I knew exactly what I wanted to sketch. A while back, an organization called Keep Washington Green raised awareness of forest fire risks and prevention, and its name became a marketing slogan. 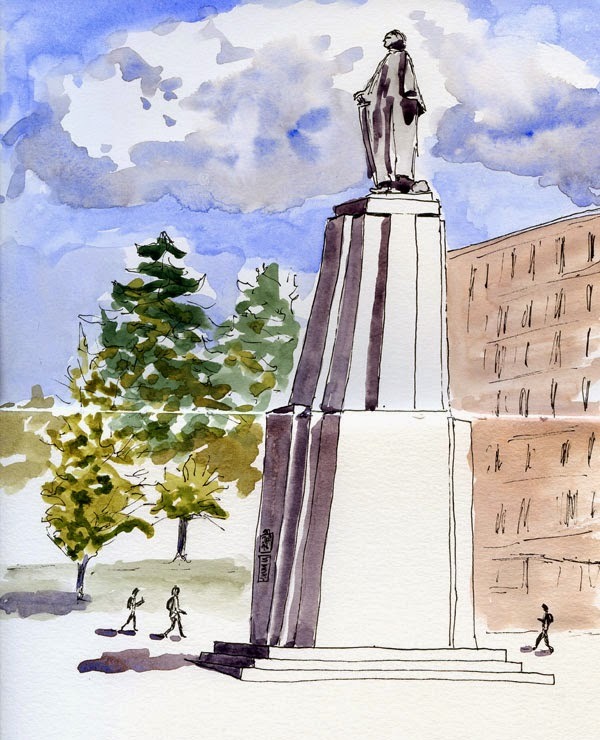 In the late ‘70s and early ‘80s when I was a UW student, pranksters routinely climbed to the top of the statue of George Washington during the night to pour a bucket of green paint on George’s head, keeping Washington green. That organization has been defunct for a couple of decades, and today’s students probably have never heard the slogan, so the bronze George (sculpted by Lorado Taft) was looking as fit as he probably did the day in 1909 that he was dedicated at the entrance of the Alaska Yukon Pacific Exposition. 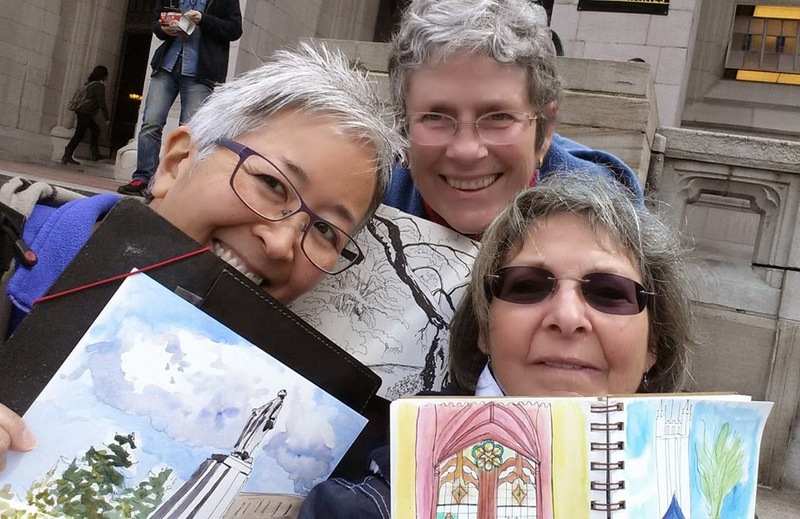 Natalie, Peggy and I were the only sketchers who showed up for today’s ad hoc, but we still honored the Urban Sketchers tradition of a sketchbook sharing and a group photo, which in this case was a selfie. Tina, Peggy and Natalie sharing sketchbooks on the steps of Suzzallo Library.